Volunteers turn out to clean up public spaces motivated both by environmental concerns and tradition. Valentina Volchenkova, 20, a student and part-time barista, was one of 460 volunteers who turned out for a corporate subbotnik at the Muzeon Park of Arts in central Moscow on April 20. “Almost everyone wanted to take part,” Volchenkova said. "But we can’t close the coffee shop for the whole day, so we agreed that some would work today and some would come next week.” Her company has scheduled a second subbotnik for April 27. Subbotniks, or voluntary labor days organized for cleaning the streets of trash on spring Saturdays (‘Subbota’ means Saturday in Russian), first appeared about 100 years ago. The first subbotnik in 1919 was initiated by Bolshevik leader Vladimir Lenin and was attended by 15 volunteers; a year later, the turnout was 425,000. During the Soviet era, subbotniks were a mass phenomenon and attendance was often mandatory. Although participation dropped following the collapse of the Soviet Union, in recent years more and more people are turning out to sweep streets, paint fences and plant flowers. Moscow Deputy Mayor Pyotr Biryukov said that 1.3 million people took part in the April 20 subbotnik. The city has promoted both April 20 and 27 as subbotnik days through billboards and other advertising. “It's great that we decided to work outside with a rake on a Saturday, instead of staying at home. We can chat and get a bit of fresh air. And we’re doing something useful at the same time,” said Anna Zaychenko, one of the five fellow-students of Volchenkova’s who joined her at the subbotnik. “It is an indicative example – a network company based on Western values, including sustainable development,” said environmental marketing expert Olga Borte. Roman Sablin, founder of GreenUp, a firm that promotes environmental consciousness and sustainability, said that he is seeing more Russian companies organize subbotniks as a new type of team building activity. 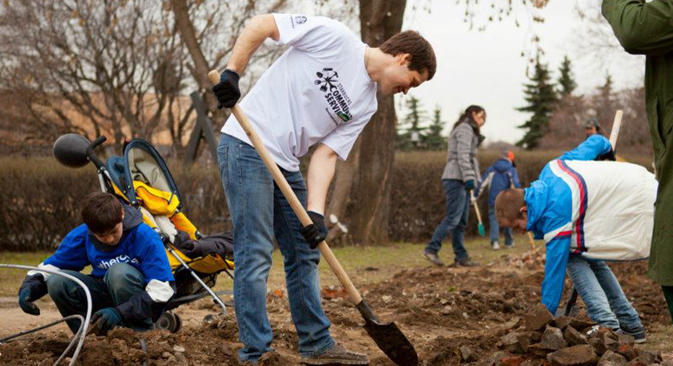 Sablin helps companies organize activities such as park cleaning and tree planting. Before each event, Sablin and his staff provide brief instructions and explain what types of waste products there are and how to separate recyclable waste products – glass, metal and plastic. According to Sablin, 40 percent of the waste collected in parks can be recycled, and one can make a bicycle out of 400 aluminum cans. “Many treat these events as a form of entertainment, back at home, many start separating waste. There is an important psychological effect,” Sablin said. The revival of subbotnik combines the idea of environmental protection, which has been slow to catch on in Russia, with a concept familiar to most Russians either from their own experience or that of their parents and grandparents. Besides corporate subbotniks, there are volunteer events organized by communities of enthusiasts. One such movement, called No More Garbage (Musora. Bolshe. Net. in Russian) is now active in 100 Russian cities. In 2004, he held the first event in his native St. Petersburg. The eight organizers were joined by 10 people. Stark paid for a truck to remove the waste. In 2010, the first subbotnik organized by the movement was attended by 1,500 people; in 2009, there were 9,000; and in 2012, 85,000 turned out. Events are organized and announced through social networks, ads in the subway and elsewhere. In September, No More Garbage will once again hold its all-Russian subbotnik as part of the global World Cleanup 2013 initiative. The Russian World Cleanup 2013 season started off with the ‘Clean Ice of Baikal’ campaign on March 30, during which 260 volunteers collected 98 bags of waste over an area of one square mile.